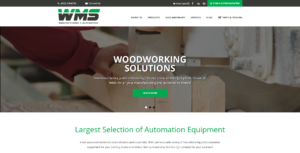 Wood Machinery Systems just launched a brand new website! Featuring a new, refreshed logo, responsive design and interactive content, our new website layout offers a customized user experience on any screen type and size, including smartphones, tablets, laptops and desktop computers. Visit our new website to learn more about Wood Machinery Systems and the products and services we offer throughout the country. Family owned and operated since 1995, Wood Machinery Systems has been providing excellent customer service for the woodworking industry’s manufacturers, mechanics and customers for over 20 years! Our new website features some exciting new functionality! Website users can now explore the different products and high-quality brands Wood Machinery Systems carries and services, browse our Used Machinery Inventory (call us for inventory check today!) and purchase select parts & tooling online. We even created a custom, interactive Find a Representative map, making it easier than ever to connect with us. If you’re interested in experiencing the Wood Machinery Systems process, please feel free to contact us today!